It is a truth universally acknowledged that a blogger in possession of even the smallest of fortune will want to blow the lot in Paperchase. (Just call me Jane Austen). That's right girls, we've all been guilty of spending a little too much when we see an adorable set of notebooks or some pretty washi tapes on the shop counter. However, going back to university this month gave me the perfect excuse to splash out on a few new goodies, so keep scrolling to find out what I bought. 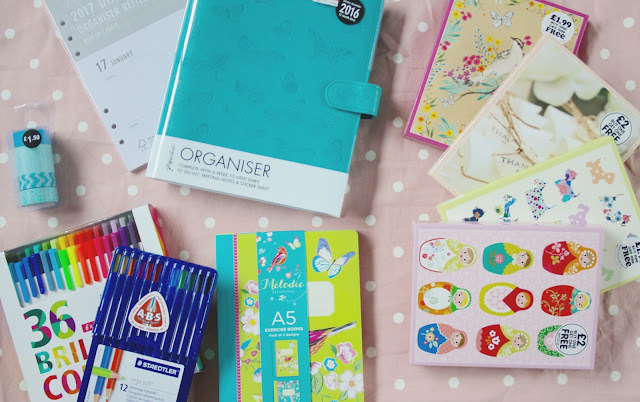 Now, I've raved about the joys of a Paperchase sale before in my Bargain Haul post, but I can certainly repeat here just how fabulous such an event is! I scored this gorgeous turquoise organiser with a 50% discount, making it just £11! 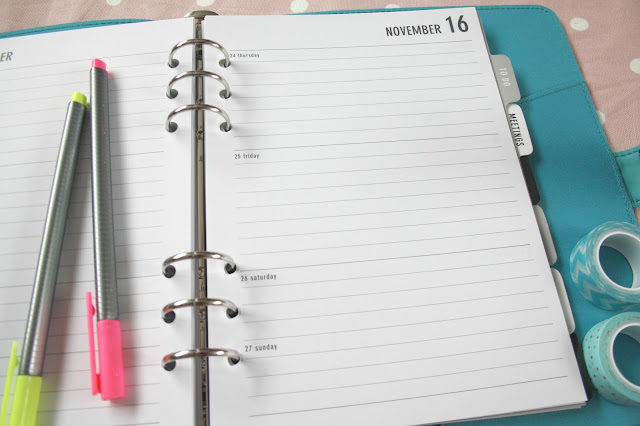 There are butterflies embossed into the soft surface of the planner, which adds a classy touch. To go with it, I picked up organiser refils for 2017, which only set me back a fiver. I wasn't able to find the exact organiser that I purchased on the Paperchase website, but here is a very similar one. Of course with a fancy new organiser, I needed some new fine liners to jazz up the pages! I selected this 36-pack of vibrant coloured pens by Staedtler, and some pencils while I was at it. I was also unable to resist this two-pack of A5 exercise books from WHSmith, which will be perfect for jotting down my essay ideas. The books are beautifully decorated with butterflies, florals, and birds. 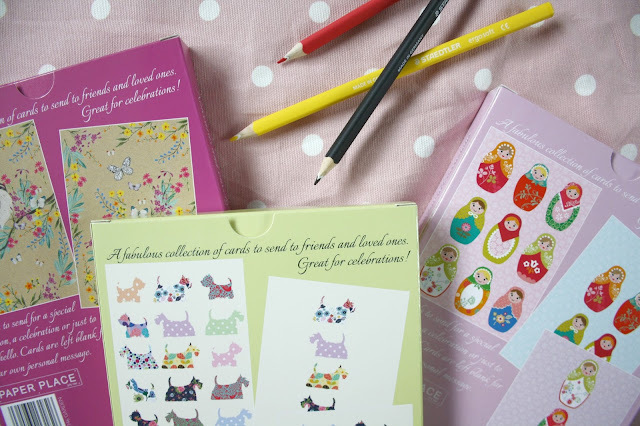 A rather unexpected place to find cute stationery is Primark. But that's exactly where I picked up an adorable 4-pack of washi tapes for just £1.50! I'll be using these to seal the letters that I send to other bloggers through the #beechat snail mail scheme. I regularly write to four or five bloggers at the minute, and I love finding new ways to decorate my letters and make them extra special for the recipient. I also purchased these packs of cards from The Works, which I'll be using for my #beechat snail mail as well. These were an absolute steal at £2 for two packs! I love the simple but cute designs! Another advantage is that they're all blank inside, so you can write letters, or turn them into birthday cards - they can be used for any occasion. Again, I couldn't find the exact cards that I bought on The Works' website, but here are some similar ones. 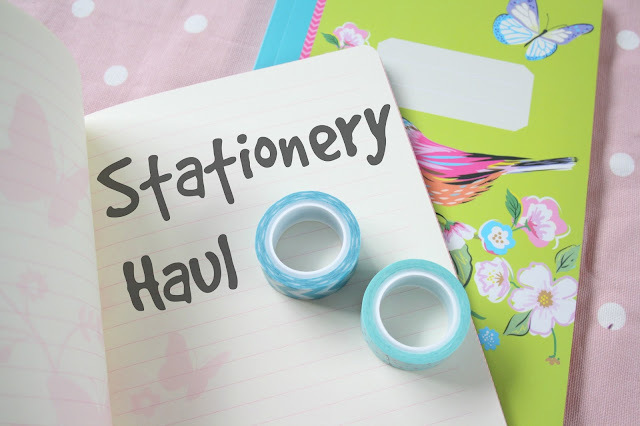 Where is your favourite place to buy stationery? What do you think is the best item that I bought? Leave me a comment below to let me know!